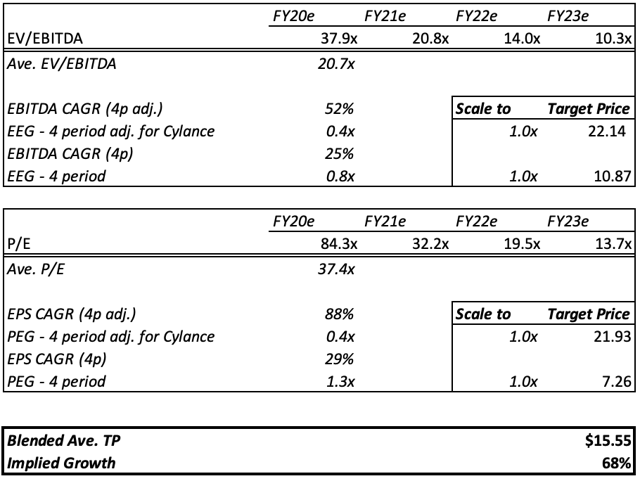 BlackBerry’s turnaround completes, with guidance of a return to total company revenue growth in FY2020 and legacy revenues forecasted to only contribute ~1%. Organic growth in software and services, the integration of Cylance, and the launch of BlackBerry Spark will drive the stock's re-rating over the coming years. The November 2020 convertible debt, striking at $10 USD, should be the final hurdle keeping shares rangebound between $8 and $10 USD per share. Modelling the company’s short-term revenue guidance and longer-term margin guidance out to FY2023 gives a $15.55 USD target price based on EV-EBITDA growth and price-to-earnings growth multiples. Risks include slower integration or profitability of Cylance, overreliance on QNX, slower uptake in enterprise/internet of things security spending, and slow progress toward management’s short- or long-term guidance. Publicly, many still remember BlackBerry (NYSE:BB) as the failing hardware device company that it was when CEO John Chen took over in 2013 - at this time, the stock traded around $8-10 USD per share compared to its peak as a leading mobile provider of over $140 per share. The reality of the situation is that, since 2013, BlackBerry has undergone a significant transition in order to pivot away from hardware and into the more lucrative, higher margin industry of security software and services. BlackBerry no longer makes branded hardware and instead focuses on ever-more-important aspects of technology, most notably including cybersecurity and the Internet/Enterprise of Things. The company recently reported results to cap off the 2019 fiscal year which detailed the significant milestones made both financially and strategically. Ahead of FY2020, we now see the stock as having fully washed out its legacy business with room to continue its return-to-growth story, with the added catalysts of BlackBerry Spark and BlackBerry Cylance to come. BlackBerry is now able to boast that it is the software and services provider to all 10 of the top 10 largest global banks and all seven of the G7 nations, while also fighting to embed their software into the evolution of autonomous vehicles. BlackBerry has begun to see the return of total revenue growth (after a number of years of declines due to the loss of device and service access fee revenues), which will be bolstered by the key growth catalysts being introduced, including the launch of BlackBerry Spark and the integration of the newly acquired Cylance business. BlackBerry Spark, which was announced on Sept. 11, 2018, is the firm's integrated secure communication Enterprise of Things platform built for ultra-secure hyperconnectivity. BlackBerry Spark boasts military-grade security, with various proposed uses from allowing connected vehicles to communicate with one another, to real-time alerts for medical teams when a patient's heartbeat is slowing in a hospital. BlackBerry's acquisition of Cylance was completed on Feb. 21, 2019 - Cylance is an artificial intelligence cybersecurity company whose embeddable AI technology will help speed up the development of BlackBerry Spark. Cylance is a fast-growing business which has benefited from the increase in awareness of cybersecurity threats and will be discussed in more detail further in this report. Despite the company's transformation and growth catalysts, BlackBerry's share price remains below $10 USD, which we believe is not representative of the changes the business has made and the opportunities ahead of it. BlackBerry is now back to total revenue growth year-on-year and will see long-term returns enhanced by the integration of Cylance and the full launch of Spark. BlackBerry's reputation has been tarnished due to its failures in the mobile phone marketplace, and it has not received the public recognition it deserves as it progresses as an innovative and growing software security company. Consequently, we see BlackBerry as an undervalued stock with further room to appreciate now that revenues have returned to growth, profits have normalized and future catalysts are clear. We have conducted a SWOT analysis to detail the key moving parts of BlackBerry's new business, while also breaking down the Cylance acquisition and modeling out the firm's financial guidance which leads us to set a multi-year price target of $15.55 USD per share. We see a step-down in earnings next year as the loss-making Cylance business is incorporated for a full 12 months However, as it becomes accretive and other business lines continue to grow, BlackBerry will be able to generate growing free cash flows, and hence, we see reason for the stock to re-rate toward higher multiples. We see strength in BlackBerry's management. CEO John Chen, before joining BlackBerry, reversed the ill fortunes of another software company - Sybase - and investors are hopeful he can do it again. The company's ability to monetize over 44k patents through royalties and licensing fees also has helped to drive revenue growth in the licensing revenue segment - these fees generated a near doubling of licensing revenues year-on-year in Q2 2019. Another strength through the company's turnaround has come from acquiring smaller security firms and building an ecosystem of security products, including the buying out of Good Technology. BlackBerry has a strong suite of products now including QNX, Radar, and Jarvis. Recent results also detail the company's financial strengths. BlackBerry reported record software and services revenue in Q4 and for the full year (2019). The fiscal outlook given for 2020 was also promising. The combination of IoT and licensing businesses should deliver organic growth of 8-10%, while BlackBerry Cylance is expected to deliver synergies and revenue growth of 25-30%, with handset revenues down to zero and Service Access Fees bringing in around $10-20m in revenues. A lot of BlackBerry's current strengths lie within the company's turnaround efforts - we see management as having mastered the transition into an enterprise software security company and believe that the latest set of financials proved the value of their offerings. QNX and Radar are growing strongly, recurring software and services revenues up to ~93%, growing margins and the timely acquisition of Cylance to drive further growth and integration efforts. We will look ahead to the opportunities that this newly turned-around business has to fulfill its growth potential and truly drive a share price re-rating. The company's key weaknesses tend to focus on what the legacy BlackBerry business represents as a failed hardware developer. Holding this history of inability to adapt is not helpful for rebranding the company as an innovator battling new technological territories. Though we see the Cylance acquisition as a positive for the business, it's set to add further losses to the overall business in FY2020. If Cylance integration takes longer than expected or comes at a higher cost, it will seriously worsen investor appetite for BlackBerry's growth story. If profitability of the acquisition is delayed beyond guidance for it to be accretive in FY2021, BlackBerry would have to wait at least another year before generating profits from this venture, and this could damage reputation and the company's cash pile. Potential over-reliance on QNX as a business segment also could be seen as a weakness of the firm - QNX makes up a sizable amount of the firm's current revenues and is the key growth driver for the BlackBerry IoT Business segment. Finally, though it's important and ultimately a positive to see revenues derived from legacy businesses decline to zero, these have previously contributed a decent amount to the top line (still 6% in FY2019) which looks to become wholly immaterial within the next 2 years (~1% in FY2020). This puts full-view on the recurring business lines to prove that the new BlackBerry can generate substantial sustainable profits and drive a re-rating. Current business lines are showing strong progress and growth, such as QNX, Radar and Jarvis. The QNX suite of products accounts for ~95% of the BlackBerry Technology Solutions (BTS) business, which makes up just over a fifth of the whole firm's revenues (22% in Q4). QNX develops infotainment systems which is used in more than 120 million cars and vehicles today, by brands, including Ford (NYSE:F), Porsche (OTCPK:POAHY), Volkswagen (OTCPK:VLKAF), Audi (OTCPK:AUDVF), and BMW (OTCPK:BMWYY). Also, under their QNX umbrella is the Neutrino operating system, which serves as a software platform for driverless car developers. Neutrino's USP is its speed - the OS is able to power time-sensitive tasks in milliseconds, whereas competitors such as Linux and Microsoft (NASDAQ:MSFT) do not yet have this capability and thus do not have the safety certification which BlackBerry does. One significant opportunity within the fast-approaching self-driving vehicle market is BlackBerry's deal with Chinese internet giant Baidu (NASDAQ:BIDU). This is a large partnership to have acquired and could give BlackBerry significant opportunity to integrate their security software into the Chinese autonomous market. Baidu is looking to become a dominant player in the autonomous car revolution, and therefore, the deal to bundle BlackBerry's QNX operating system into Baidu's Apollo platform could be a lucrative source of future revenues. BlackBerry has a significant opportunity to position themselves strategically as an integral player in the future of the automotive industry. QNX's capabilities and the integration of Cylance's technology with the development of BlackBerry Spark also adds scope to grow into the rapidly-expanding Enterprise/Internet-of-Things arena, amongst other areas, and capitalise on the trend of integrating society with technology. The acquisition of Cylance early this year signaled the completion of BlackBerry's turnaround. They have possessed further cybersecurity capabilities to differentiate their software offerings - a useful selling point for a company's platform on which the security of many millions of commuters and travelers' lives may rest in the future. Given the recent prevalence of malware and hacking, this acquisition provides further means to offer mitigation to these risks and new AI capabilities give the firm a true competitive edge. Cylance's focus on PCs and laptops also will compliment BlackBerry's focus on mobile devices to offer an even broader range of products to serve all devices. Further opportunity lies within the release of BlackBerry Spark - Chen noted in the Q4 conference call that they remain on track to release the first module for the platform in September. Of course, given the opportunities at hand via the Cylance acquisition, a key threat for BlackBerry is that the integration with Cylance is smooth and generates the desired synergies both financially (i.e. becoming an accretive business line in FY2021) and technologically (i.e. integrating with, and accelerating the development of, Spark). There's a lot of pressure on the acquisition to succeed, given that it has taken up a large amount of BlackBerry's cash at a time when Cylance itself is still making a loss and with a large amount of BlackBerry convertible debt coming up to maturity. Financially, BlackBerry may also face a threat from this upcoming debt exposure. The firm currently has $605 million of convertible debt maturing in November 2020, at a price of $10 per share. Given the $1.4bn cash spent on Cylance, BlackBerry now sits on only $1.0bn, which leads to a net cash position of $400m after this tranche of convertibles. The threat from the conversion of these instruments is either pressure on BlackBerry shares or on the company's cash position. If the stock is trading above the conversion price then a swift conversion of $605m in convertible debt could lead to profit-taking and selling pressure on the shares, while the danger of the share price remaining below $10 is that debt holders may not convert to stock and BlackBerry would have to pay the debt in cash. An opportunity to dismantle debt worries may lie in re-financing the debt instruments, however, if this is not possible, then given Cylance will be loss-making in FY2020, the business may not generate large amounts of free cash flow in the year, and this, combined with the conversion reducing cash holdings to $400m, may lead to some investors worrying about the business's financial needs. The uncertainty around this issue is arguably the largest threat to the business and share price over the coming year - for this reason, among others, we have developed our target price to cover a multi-year holding window as we see the stock range-bound below the $10 call price until the air clears. Despite BlackBerry's promising position as a software platform provider, they continue to face threats from other large tech firms, such as Apple (NASDAQ:AAPL) and Alphabet (NASDAQ:GOOG) (NASDAQ:GOOGL), as they develop their own proprietary OS's for driverless cars. While BlackBerry may boast cybersecurity, these competing firms have an advantage due to their existing - sometimes fiercely loyal - customer base and stock of application developers. The emphasis on each player's competitive edge is yet to be played out since driverless technology is still in its infancy, but from a regulation point of view, it may be more favourable to provide invaluable security software than a range of applications and hence BlackBerry's take on the market may prove more of an opportunity than a threat. As previously discussed, we see significant value set to be generated by the acquisition of Cylance, and hence, we will now look to break down Cylance's business in a bit more detail. BlackBerry's $1.4 billion acquisition of the AI-based cybersecurity firm marks their largest acquisition since the starting of the company and a big move into adding AI capabilities to their security offerings. Cylance's AI offering aims to be able to intercept security breaches before they occur, hence keeping firms a step ahead of potential threats. Cybersecurity has become an increasingly attractive market for solutions providers, and therefore, this acquisition bolsters a lot of opportunities for BlackBerry. There are an increasing number of cases of data breaches of high-profile individuals and high net worth companies, which has driven the demand for cybersecurity higher and higher, making the market a key growth sector for the continued rise in technology. Gartner expects worldwide information security spending to exceed $124 billion in 2019, an 8.7% increase from 2018's greater than $114 billion spending bill. The use of such cybersecurity systems allows companies to securely use technology in order to drive innovation and growth and become more competitive and profitable. Cylance is the first company to use AI, algorithmic science and machine learning to attempt to recognize and prevent cybersecurity before it actually happens. Their predictive analysis allows the software to identify threats and prevent the code from executing on a targeted system. Two years ago, Cylance passed the $100 million revenue mark, having only started 39 months prior, making them one of the fastest-growing security companies in history, surpassing other publicly traded companies such as CyberArk (NASDAQ:CYBR), FireEye (NASDAQ:FEYE) and Palo Alto (NYSE:PANW). This was all thanks to the support of its 3,800 enterprise customers, including more than 100 Fortune 500 companies with big names such as Dell (NYSE:DELL), Panasonic (OTCPK:PCRFY) and The Gap Inc. (NYSE:GPS) choosing Cylance as their favoured security specialists. They also noted (with respect to year-end 2015) as being the fastest-growing private cybersecurity company in the Prestigious Inc. 5000 "with more than 7,000% growth over three years." During BlackBerry's full-year 2019 presentation, Chen noted that Cylance's revenues for the same period as BlackBerry's 2019 fiscal year would have been $170m, which would have represented a 19% addition to BlackBerry's organic revenues. Management guided to between 25% and 30% revenue growth, from this base, during FY2020, which will help to drive the total business' revenue growth of 23%-27%. A key differentiator for Cylance, other than its revolutionary technology, is the fact that it requires relatively little memory and power in order to work, thereby allowing it to be used on regular computers and smaller connected devices. As BlackBerry already have endpoint management tools, the acquisition of Cylance's capabilities could help to make them a "one-stop shop" in the security market. We will now look at BlackBerry's financial performance and discuss how we have interpreted the company's guidance and growth prospects to derive a multi-year target price for BlackBerry as an enterprise security software business of $15.55 (a ~68% gain on Friday's closing price, $9.27). The completion of BlackBerry's fiscal year 2019 appears to have locked in the completion of the company's multi-year restructuring effort to pivot from a shrinking hardware device company to a growing software and security services innovator. There was significant evidence of how far the company has come during the FY19 results presentation. For the full year, BlackBerry grew software and service revenues by 10%, with double-digit billings growth and an increased non-GAAP EPS of 24c per share, up 68% from 14c in the prior fiscal year. Free cash flow generated over the period, on the basis of management reporting, comes to $83m. CEO John Chen notes that in Q4 the company achieved 8% year-over-year total company revenue growth - this was lauded as the first total company revenue growth for many years due to the continued decline of handset revenues and service access fees, which were down to only $59m and set to diminish further in FY2020. Management saw this as a significant milestone which indicates the company has successfully pivoted to become an enterprise software company and expect each quarter next year to deliver year-on-year revenue growth. BlackBerry's current performance also tracks ever closer to their "timeless model" targets - recurring software and services revenue at ~91% is in line with guidance of ~90%, while the company's profit margins still have room to eke out more efficiency gains and drive valuations higher: Non-GAAP gross margins for the year stood at 78%, vs. a target of ~80-85%; non-GAAP operating income came in at 13% against a target of ~20-25%; and, adjusted EBITDA registered 20% margins, with view to bolster this ratio up to ~25-30% guidance. It is worth noting that the Q4 results (although a particularly strong quarter) included a gross margin of 82% and an EBITDA margin of 28%, which shows the potential for the business in the years to come. Achieving these margin targets while also growing the business as Cylance matures, Spark is launched, and the enterprise-of-things, autonomous vehicles and new technology develops over the coming years, BlackBerry should see strong appreciation in their shares' value in order to maintain reasonable valuation multiples. By adding Cylance into BlackBerry's growing portfolio, we see a pivot in BlackBerry's story from a turnaround stock whose revenues are in substantial decline due to various legacy business lines being washed out, to a forward-looking, well-managed technology firm with a number of business lines ready to capitalize on key trends in technology. Cylance is a prime example of BlackBerry's upcoming growth drivers - management's guidance suggests that in FY2020 Cylance will contribute around $80-90m in losses but further to that, they expect the acquisition to become accretive in the following year and all those thereafter (for prudence we have modelled Cylance having a nil effect during the 2021 fiscal year before becoming accretive). "We believe the total revenue growth will come in between 23% to 27%, driven by a double-digit percentage increase in billings." "Revenue growth is broken down as follows: IoT business unit growth of between 12% to 16%. We expect BTS to grow faster than the Enterprise UEM business." "License we expect to decrease 5% year-over-year as we focus on closing opportunities that build upon our recurring licensing revenue base." "Based on our pipeline, we are working towards a goal of around $270 million in Licensing revenue in fiscal year 2020." "In summary, the combination of IoT and Licensing business units should deliver organic growth somewhere between 8% to 10%." "We expect BlackBerry Cylance growth somewhere between 25% to 30% from a base of around $170 million for the 12 months ending Feb. 28, 2019." "We are adding about $300 million of costs related to Cylance. This will break down to about $75 million in the cost of goods sold, and $220 million in operating expense." "As previously noted on the November announcement call, we anticipate the acquisition to be accretive in the second fiscal year and thereafter." "Service Access Fees to be around somewhere between $10 million to $20 million." "BlackBerry's standalone annual gross and operating margin profile is largely unchanged." We have built a model out to 2023 for BlackBerry's business (using non-GAAP financials, given guidance is on a non-GAAP basis, and the gap to GAAP is no longer as extreme), which includes the integration of Cylance (becoming profit generating in FY2022), legacy revenues falling to zero, and a trend toward BlackBerry's "timeless model" margin guidance. Revenue growth (driven largely by Cylance) and improving non-GAAP operating and adjusted EBITDA margins (driven by the declining legacy business impacts and increasing efficiency) drive non-GAAP EPS up to $0.68 USD in 2023. Our non-GAAP revenue projections can be seen in the chart below. 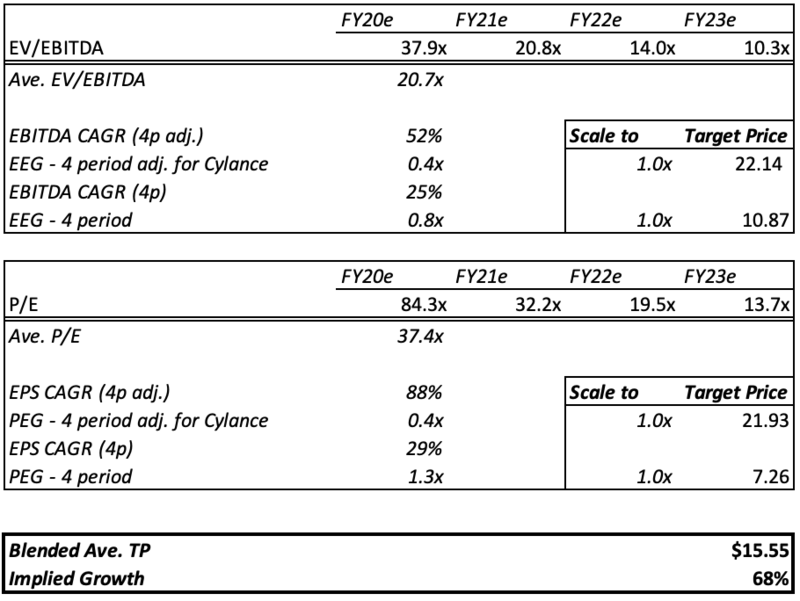 To derive a target price from our forecasts, we have compared both price-to-earnings growth and EV-to-EBITDA growth multiples to test how the valuation evolves and whether or not it is factoring in the potential growth of the business now that BlackBerry can truly experience life as a pure security software and services provider. The result was that by scaling up these growth multiples to trade at 1.0x (i.e. "fair value"), we see that BlackBerry's stock price has the potential to trade toward $15.55 USD once the growth of the business over the next 4-5 years are realized. The following tables detail our calculations toward our four price derivations. We have run multiple scenarios for prudence, with our final figure being a blended average of the four. We have used two different CAGRs for each EV-EBITDA growth and price-to-earnings growth in order to include and exclude an adjustment to 2019 figures for Cylance's financials, to encapsulate the different ways of looking at earnings growth from 2019. 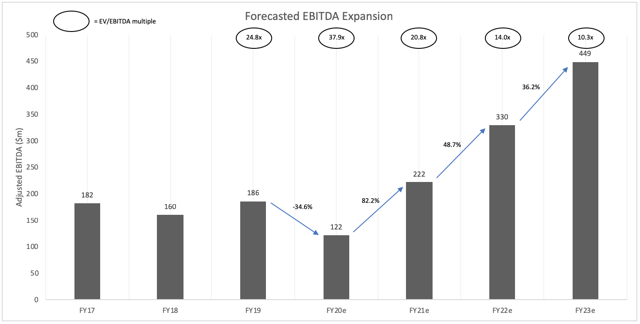 Our modeled EBITDA figures can be seen visually depicted in the following chart, accompanied by each year's EV/EBITDA multiple based on current valuations. BlackBerry is now competing in a number of next-generation technology segments, such as the autonomous/self-driving vehicle marketplace, AI-enhanced cybersecurity offerings, and the Enterprise-of-Things landscape. The firm is proving their innovative capacity and have taken a number of sizable steps into each field, but there will be a lot of competition into these particularly strong growth areas. Large tech players and new companies alike have shown interest in these fields - big tech names such as Apple and Alphabet are exploring the autonomous vehicle revolution, attempting to develop operating systems to challenge BlackBerry's Neutrino, while smaller firms are fighting BlackBerry Cylance for dominance in areas of the cybersecurity marketplace. Cybersecurity is an area of growing importance within the tech sector and has attracted a lot of investment and attention, especially in light of data privacy concerns and new regulation such as the GDPR. The market is saturated with a lot of competition and differentiated offerings. Large incumbent players in the space include anti-virus firms such as Symantec (NASDAQ:SYMC), which boasted revenues of $4.8 billion in 2017, and McAfee with >$2.5bn revenues. AT&T (NYSE:T) recently launched their own cybersecurity division - having access to AT&T capital may allow the branch to grow and prosper. Fortinet (NASDAQ:FTNT) also demonstrated the ability to generate strong revenues in the field, with $1.4 billion in 2017. Smaller firms also continue to drive innovation and competition, with examples including Rapid7 (NASDAQ:RPD), Synack and Proofpoint (NASDAQ:PFPT). Competition for investment may also increase, given the plans for a number of these smaller firms to IPO over the coming years. There are a number of firms competing around the more niche and innovative cybersecurity spaces, including BlackBerry's newly acquired Cylance operations. Chen highlighted in the Q4 earnings call that the "second generation" of firms in the cybersecurity space, focused on AI and machine learning, are the real competitors for Cylance, which include Carbon Black (NASDAQ:CBLK) and CrowdStrike. It's noted that within this second generation, there are two major fields, the EPP and the EDR, and within the analyst community, Cylance ranks first for EPP, while in the EDR space it is noted that they have the newest set of products as well - making it a serious competitor within the marketplace. In spite of the levels of competition in a lot of BlackBerry's key fields, the firm has a strong reputation as a security provider, a strong suite of products which will continue to grow via the integration of Cylance and introduction of Spark, and great management with specialist sector knowledge. For these reasons, we believe BlackBerry will continue to succeed as a security software provider - we believe that they can prosper and generate significant growth and client wins, as demonstrated by the agreed integration of their autonomous OS with Baidu's Apollo platform. To conclude our thesis, we believe that BlackBerry should be viewed as a resurgent stock. Revenues have been in decline for years now as the legacy business was washed out, but we now see the company's turnaround as complete with room to buy the stock before true revenue and profit growth starts to emanate from the business, allowing the stock to re-rate. The company did fail in the smartphone market, and it received ample public scrutiny for it, but BlackBerry is now a wholly different entity, focused on its core values as a security software company under reputable management. The firm is investing into high growth tech markets that will prosper as the next wave of technology reaches shore. Management has proven their ability to turn the company around and under Chen's leadership they are now driving both organic business growth and growth through tactical inorganic opportunities such as the acquisition of Cylance, which is expected to deliver synergies and add ~20% to revenues over the next fiscal year. The launch of BlackBerry Spark, which they are on track to begin in September, will act as a further growth catalyst, while current business lines (such as QNX and Radar) will build on solid foundations. BlackBerry reported record software and services revenue in Q4 and for the full year in 2019 and the fiscal outlook given for 2020 is strong with total revenue growth year-on-year expected to be achieved each quarter. The company is now fundamentally much stronger, and we believe that now the legacy business has fully diminished, the resurgent business will begin to trend the company's top and bottom lines higher, demanding higher valuation multiples. Our investment thesis now treats BlackBerry as a growth stock investing into next-generation security software and technologies, such as the enterprise-of-things, which disregards past failings in the mobile hardware space - this is reasonable because the company is now fundamentally changed and is focused on its core competencies around security software. Note: our financial forecasts are based on management guidance and the author's assumptions and should not be assumed to be entirely accurate. Risks to the accuracy of these forecasts include management not hitting their guidance, a longer-than-expected integration or profitability process for Cylance, a slower-than-expected adoption of incoming technologies, amongst other factors. You should not make any investment decisions based on these figures alone.